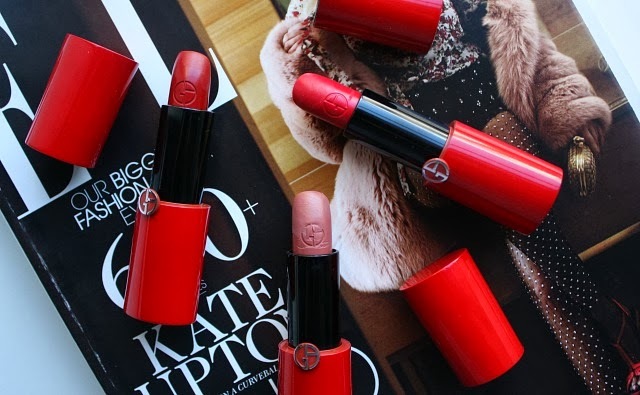 What initially struck me about the lipsticks is the intense color pay off, followed by the smooth texture. Their claim of 'color and comfort' is reflected in the lip balm-like texture and opaque pigmentation - which almost seems like an oxymoron. But Armani has managed to pull this off perfectly, creating Rouge Ecstasy, a hybrid lipstick that is as comfortable as it is luxurious. 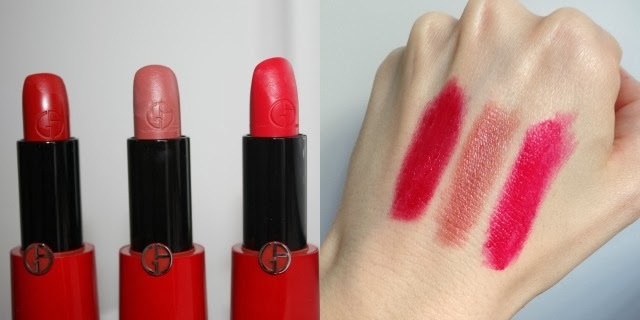 You can see from the swatches that there is a creamy and moist texture to the product, but the color is vibrant and rich. While they do go on with a slight glossy finish, they dry down to a natural matte and wear for hours and hours (and hours). My lips took to them immediately and felt actually better after wearing them. After the initial intense color pay-off wears for awhile, what is left is a beautiful stain that has significant staying power. Kudos to Armani for being one of the first to bridge the gap from CC creams for the face to a CC color product in such a flawless way. The only thing left to do is decide how many other colors I need to purchase. Life is so hard.